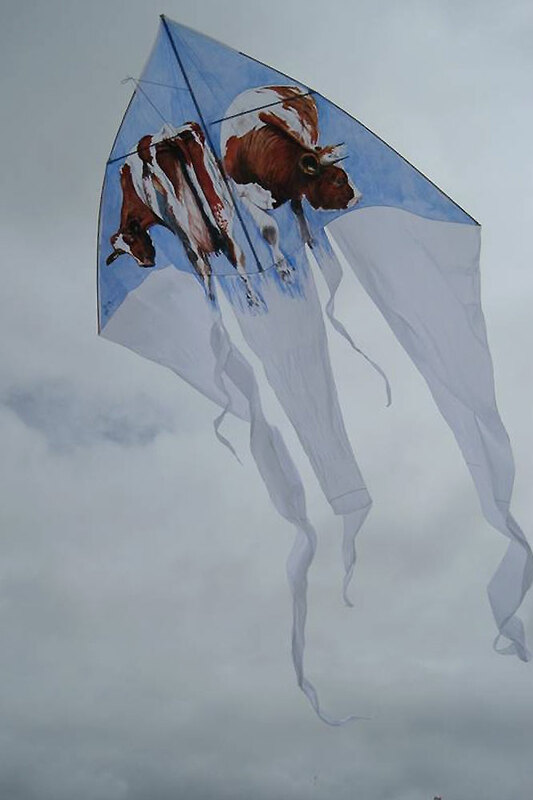 Jeltje Baas, artist, living in Oosterstreek, has always been interested in kite flying. As a child she started flying kites, together with her brother and his friend (of Indonesian decent, loved fighter kites) or with girlfriends or nephews. 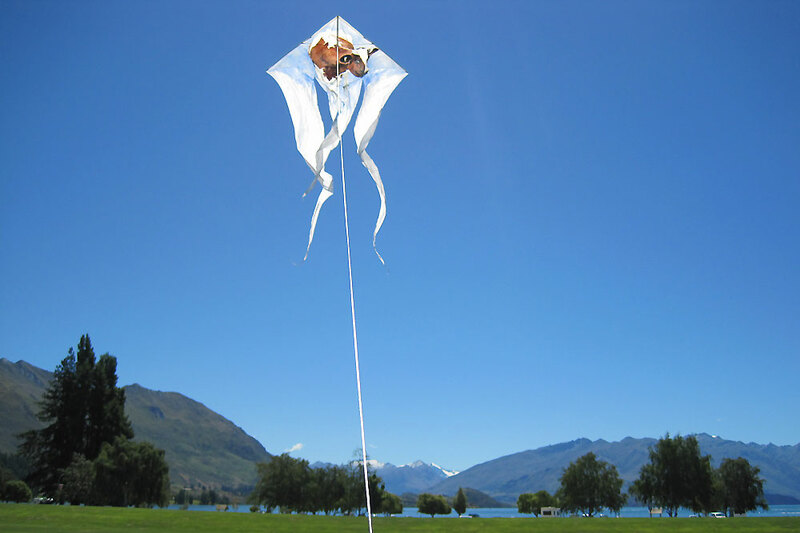 The kites were homemade kites; you did not buy them in those days. 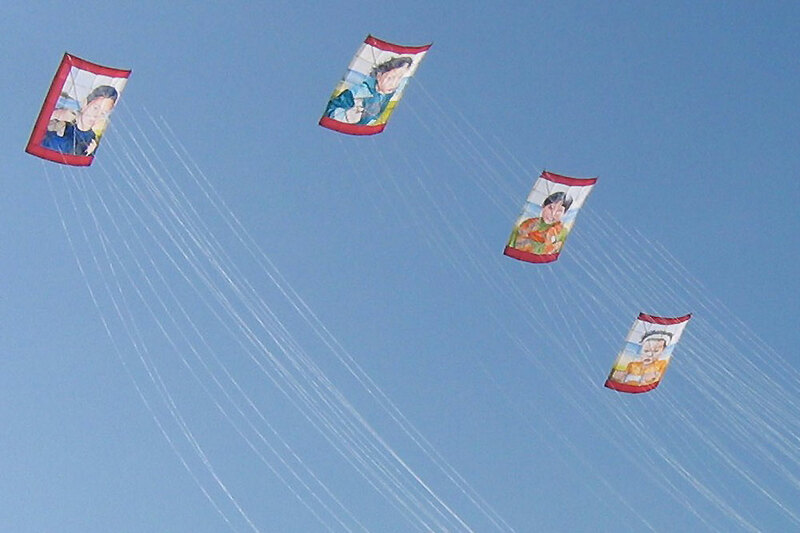 Those kites and the kites she flew with her children and later on with her grandchildren were made from wooden spars and kite paper or nylon or Japanese paper, tails with grass and folded paper, and they were of course decorated. 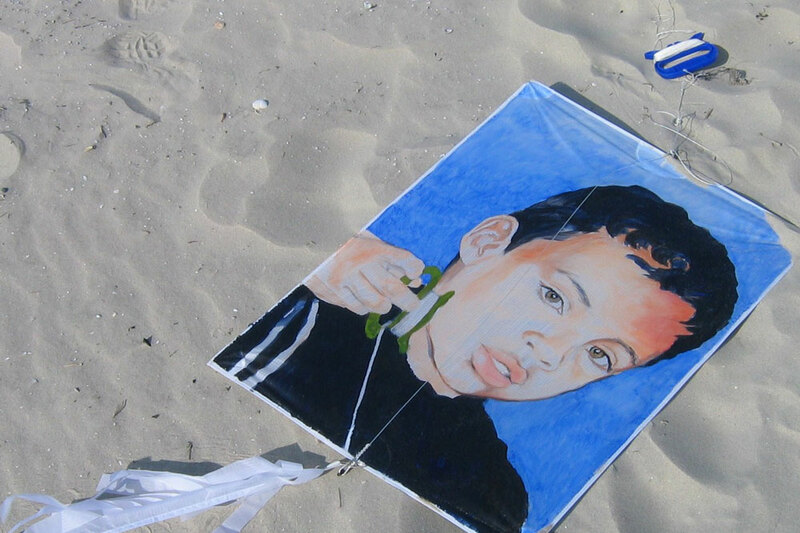 Flying kites was no daily occurrence; there was more a warm commitment. 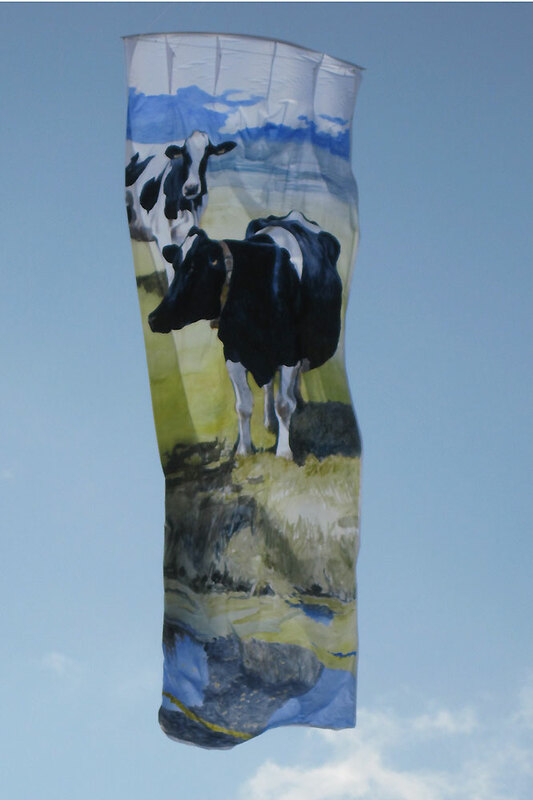 In 2007 she wanted to paint big kites for a project involving cows (she is a portrait painter, paints landscapes, but is also a cow painter). 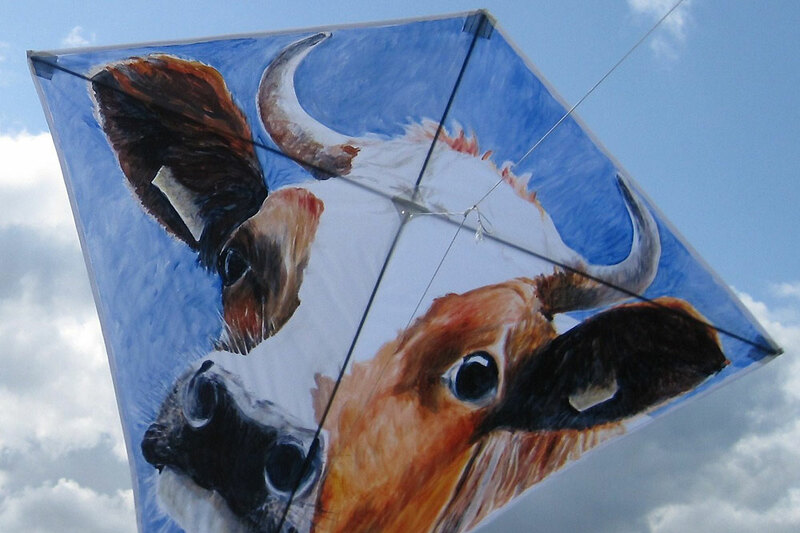 She visited a kite festival in Drachten and asked members of the Wynpûst Kite Club about the new materials. 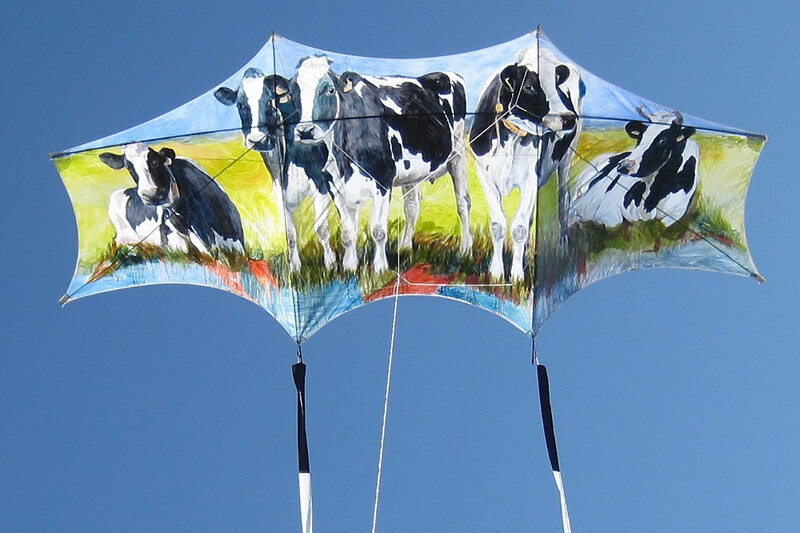 She wanted cows on kites to fly above the paddocks; they often (in the Netherlands) were not allowed to graze outside any more. 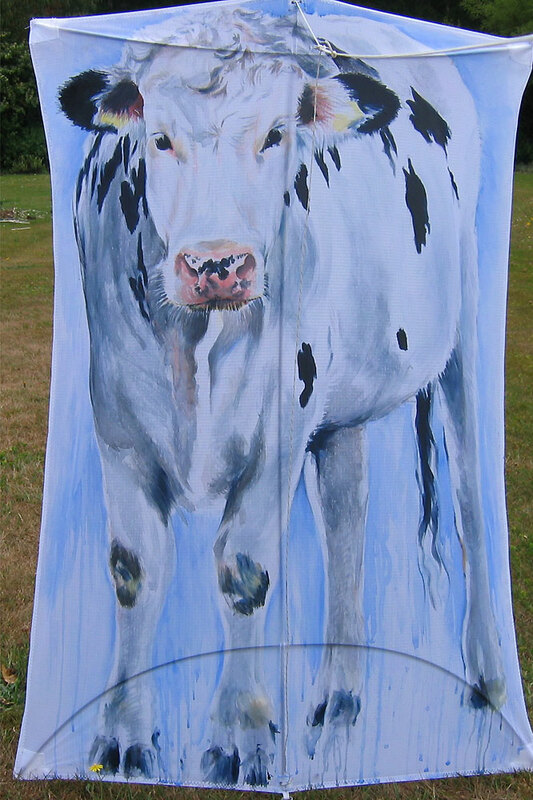 This resulted in the kite project (it premiered with six kites at the Nelson Kite Festival in New Zealand) with at the moment 14 cow kites: Ohashi Edo’s, delta’s, an eddy, a genki and a bed sheet kite; she is always looking for different styles of kites to paint on. 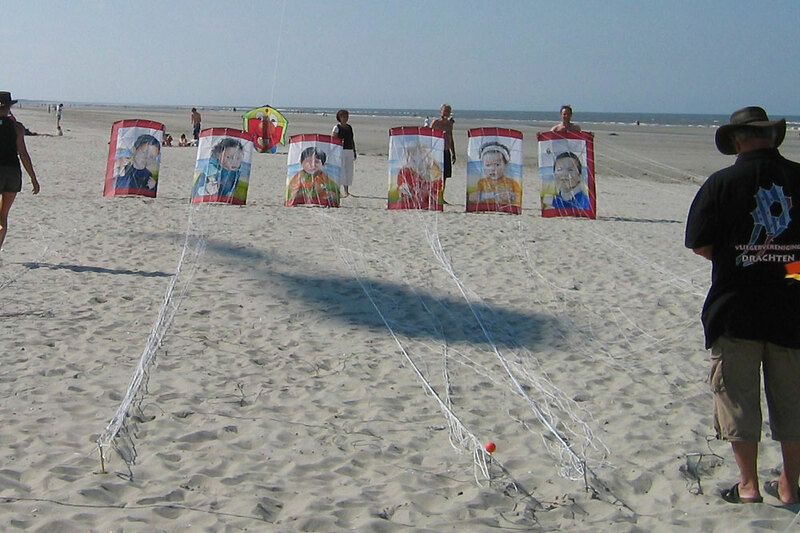 Before this project she painted six Edo kite portraits (Children of the World), six members of Wynpûst made the kites, Jeltje painted them. 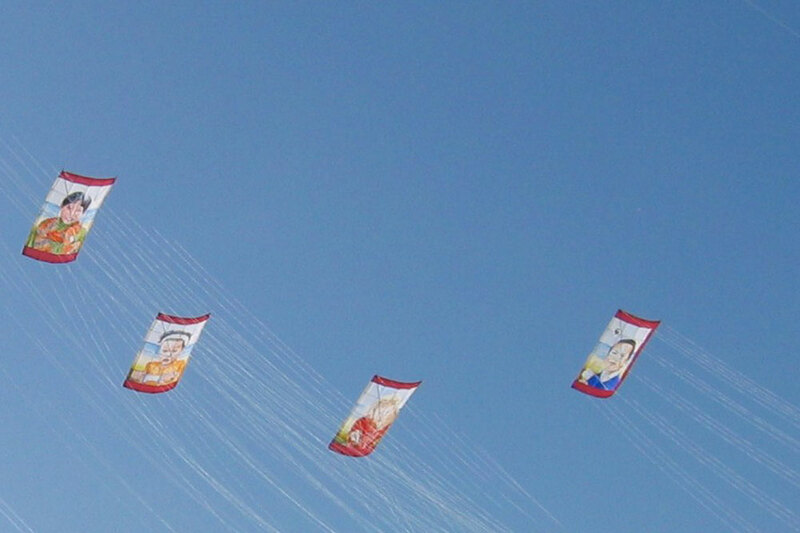 She shows the kites in exhibitions as well. 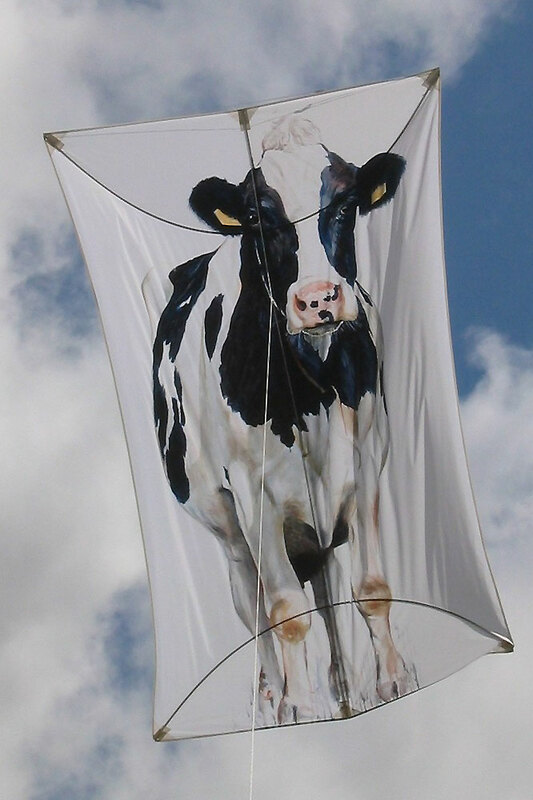 She joined the Wynpûst Kite Club in Friesland. 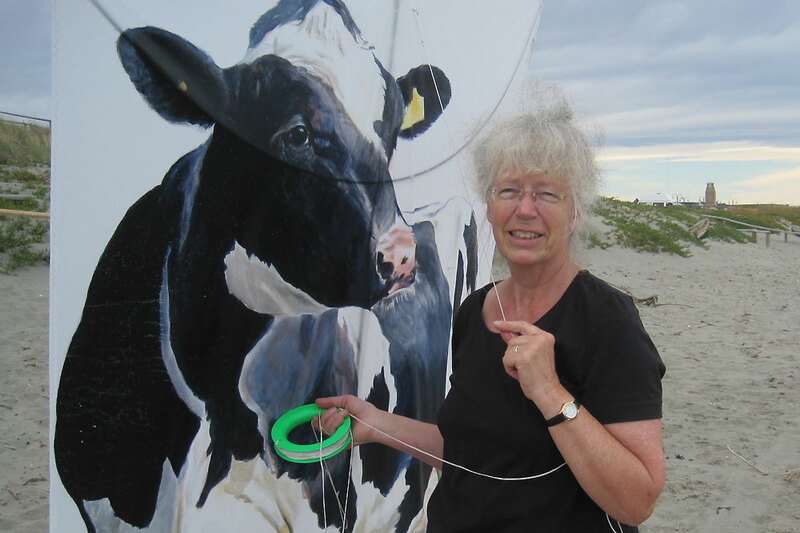 She meets very enthusiastic art kite builders there. 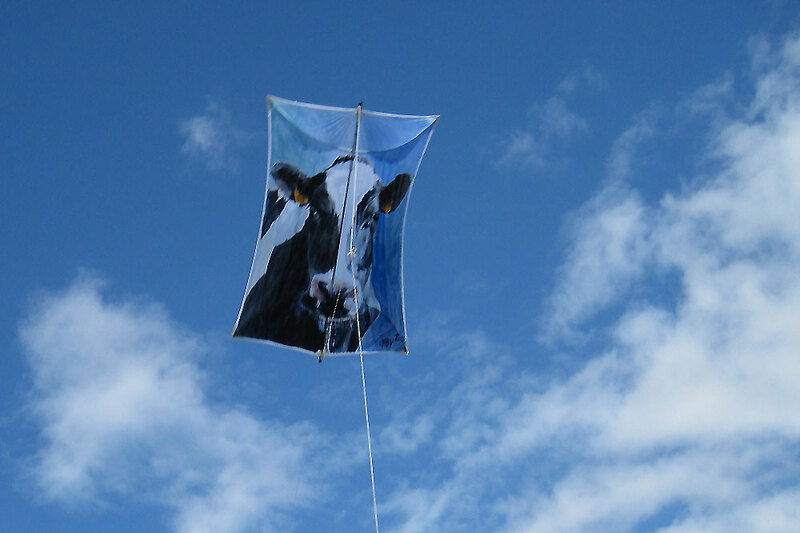 She flies her kites in front of her home in Oosterstreek and anywhere with space and opportunity. In New Zealand she loves to fly her kites on the beach near Christchurch. 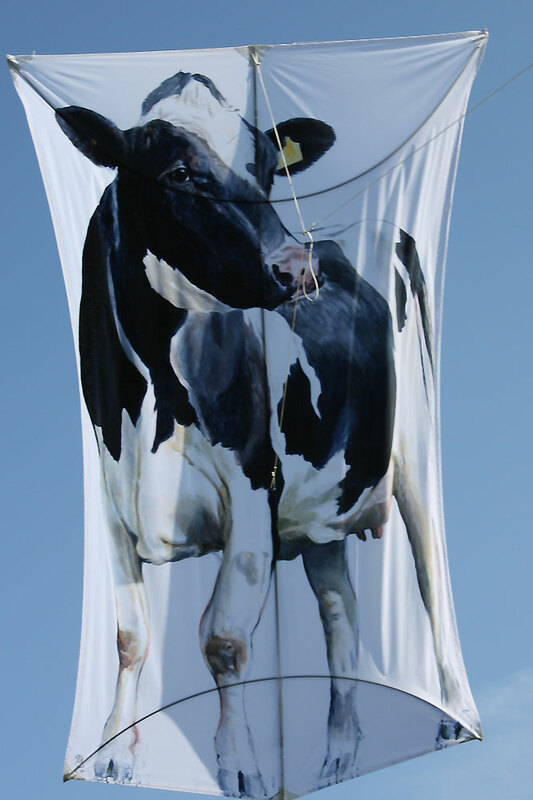 She also attends International Kite Festivals in Europe and in New Zealand. 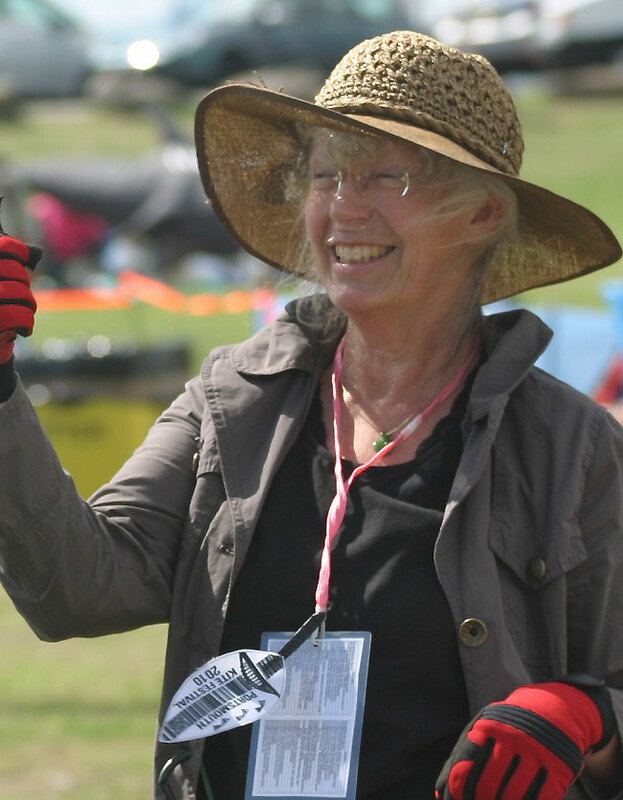 Making new kites in New Zealand she discovered the Peter Lynn Kite Factory in Ashburton and bought fabric, spars and lines. 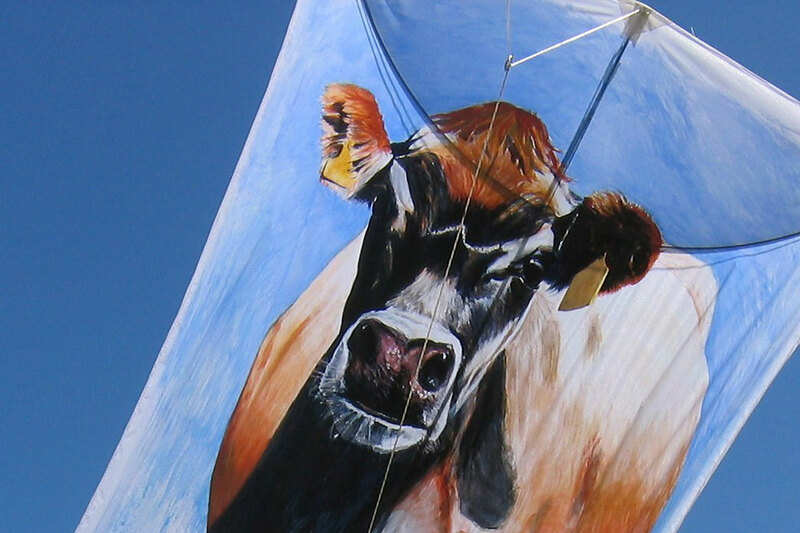 She met kite fliers at festivals and joined the NZKA. 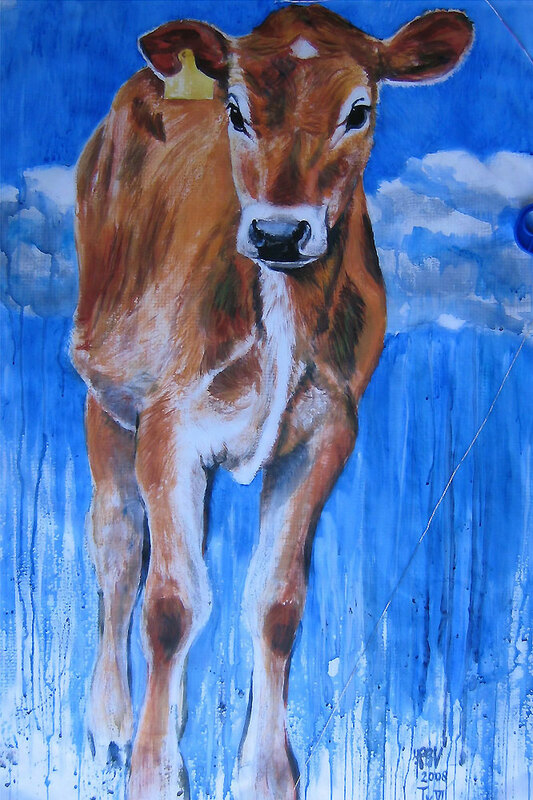 She loves showing her flying paintings in the sky, the play of light and wind an added value. 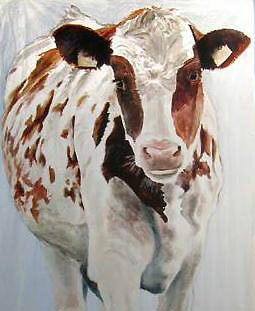 She loves to fly a whole herd of cows together when the weather conditions allow it, using sand anchors.